Big fabric printing for trade show dispays here. Great quality offered. Large custom printed fabric signs for trade show booth & backers, Signs Banner Online can print and sew your graphic creatives on larger than normal prints. Big fabrics like these offer better graphic results and images can spread out full size giving you maximum trade show booth achievements. How to set up the booth is better too because one single piece will look more natural and can span across the full back wall, drape or hang. It's a better option. 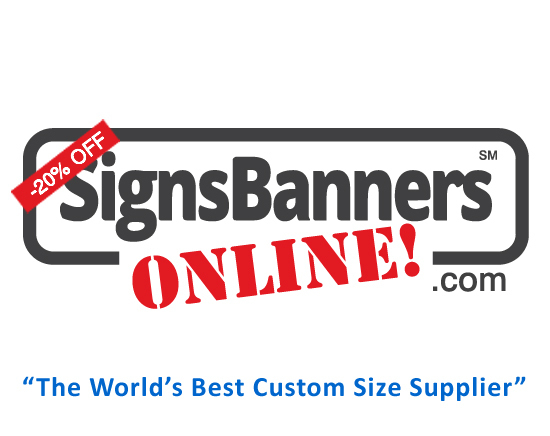 Custom size: Signs Banners Online are the experts at custom sizes so if you want a full size wall or partition graphic, use their calculator to order. It really does help. Their respect shows when you see them produce orders like this for clients. Exhibitors like using display fabric for trade show booths because they can stretch out the graphic and fold it up for the next booth or stand... and... it's so easy to modernize it for any show. Dont make your attendees guess whats new... use a fabric graphic to keep every booth upto date... this came to us from a customer who .... replaced the booth every day with the daily special... FRIDAY Exhibition specials... brilliant! Every trade show booth needs marketing... the fabric achieves many results. You want people to talk to people... so make the backers full color, interesting and new. The pop up wall, expand wall, link wall or any other can be identified and a new graphic placed on it using hook n loop, staples, ties etc. There are so many advantages of using fabric vs panel or stretch over.